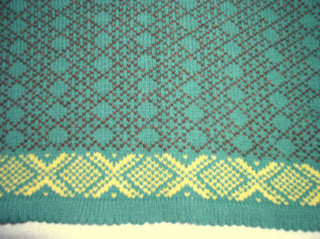 My own design from house sale wool. 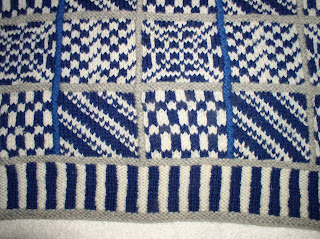 Dale of Norway Salt Lake City Olypmics (2002) knit during 2006 Olympics as part of the Yarn Harlot dare. 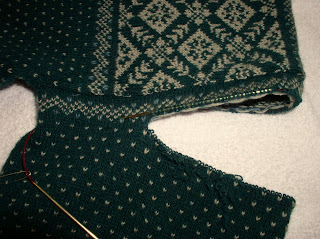 The Ethnic Knits Norwegian Sweater is finished, but I had a problem. The sleeves were too long. 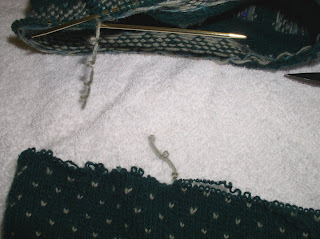 Wednesday was spent in sleeve surgery. The surgery went as follows. 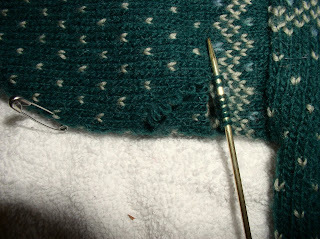 Working in the sleeve section where there are no increases, separate sleeve putting stitches on a circul ar needle. 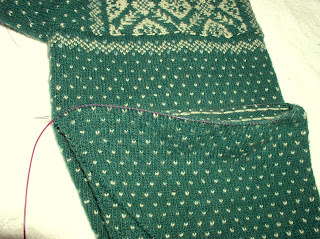 Luckily I worked the increases every 4 rows, and then worked straight until I had the length I thought I needed. 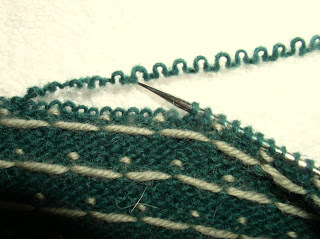 Just cut the yarn and frog until two rows before the pin. The pin is on a lice row. I'm keeping the one row above it. 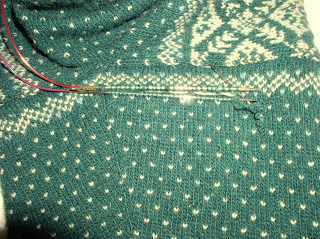 The stitches just wait to be picked up on the sleeve needle. 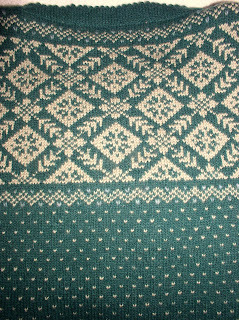 Shetland type yarn doesn't run easily. About 2" was frogged. I did measure carefully! Some of this is due to stretching. 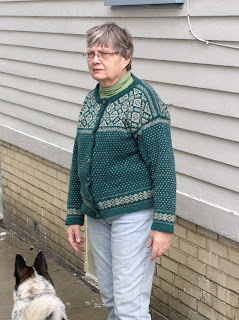 I wore the sweater for a day before surgery. That helped me decide how much to remove. Grafting commenced. 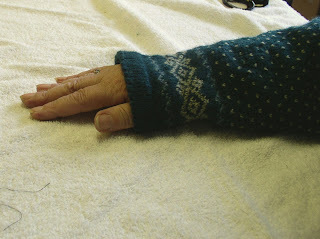 160 stitches per sleeve. The first sleeve is almost finished here. The second was finished before I went to bed. 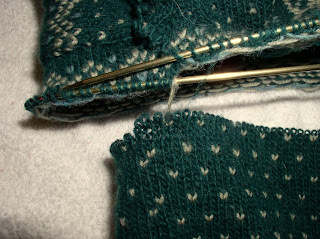 I even wove in a few yarn ends at the wrist of the second sleeve, as well as the yarn ends caused by the surgery. 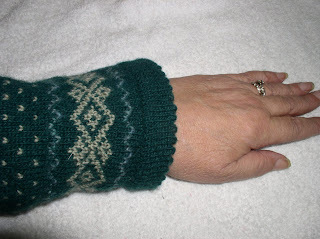 Finished and wearable. Of course, the dog had to get in the picture. We had snow on the first day of Spring, but I'll show pictures next time. Oh, Lorrie. It's really great. You should be quite proud of yourself! 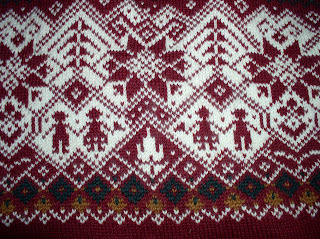 Your Fair Isle knitting is beautiful. I especially like those socks! 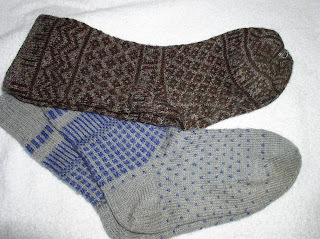 I have done fair isle surgery before too....to replace color bands! It's tedious, but definitely worth it in the end. Would you come back to my blog and share your method for razor blade ripping? p.s. Are you an ASDP member? WOW, you really ARE a MASTER!!! What wonderful work you do, thank you for sharing it with us kindergarten knitters!